On this page you will find any combo packs (truck and trailer skins) that I choose to release. All trailers included in combo packs will be stand alone and will NOT replace any in game companies. Please check the blog post to see what mods are updated for the latest public game versions. When unsure check the version file in the rar folder. This will always contain the version number the mod was released for. 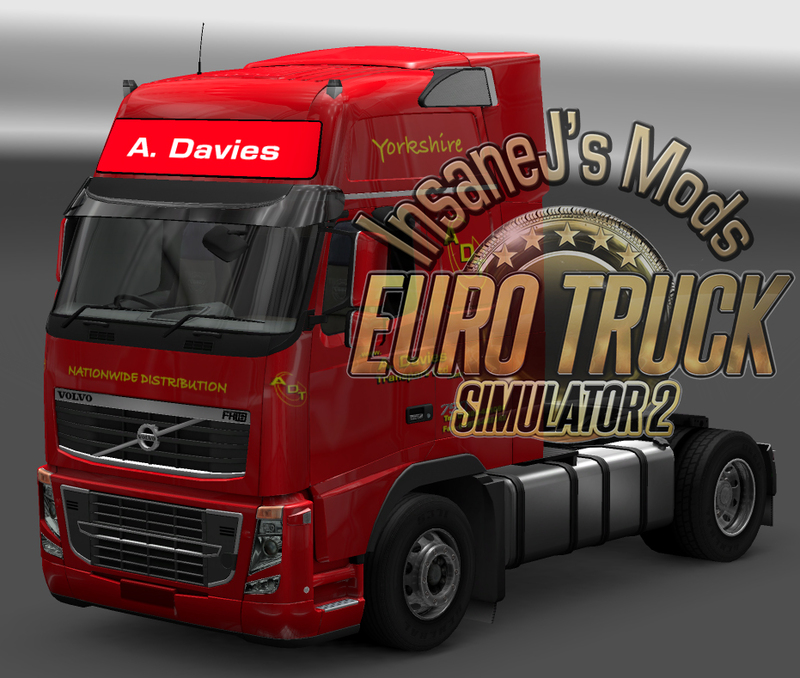 The pack includes a DAF E6 and Volvo 2009 skin and a curtain side trailer. DAF and DAF E6 Superspace, and Mercedes Actros Streamspace. Also includes a trailer and AI combo. This combo includes a walking floor trailer, skins for Volvo 2009, Volvo 2012/13, Scania Streamline Highline, and Scania R Topline. 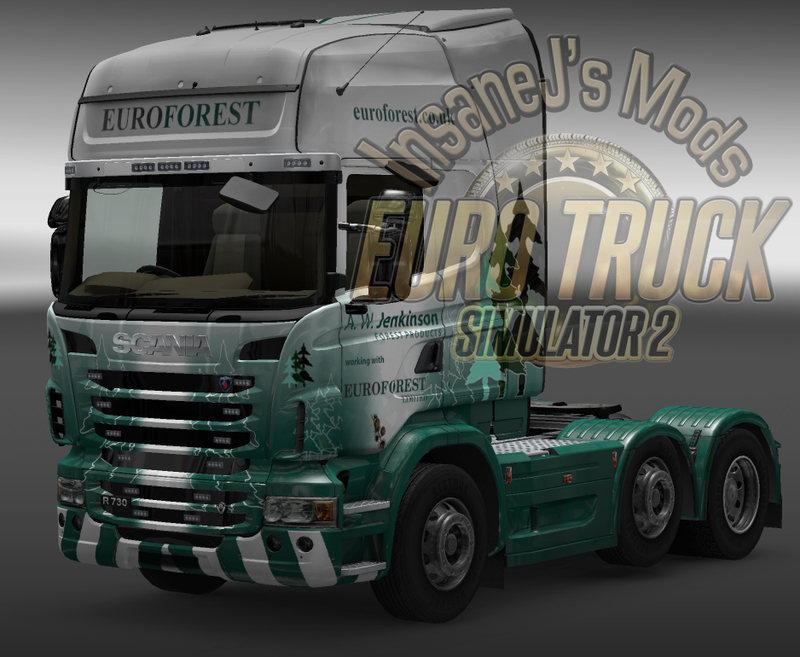 There’s also a EUROFOREST skin for the Topline by request. 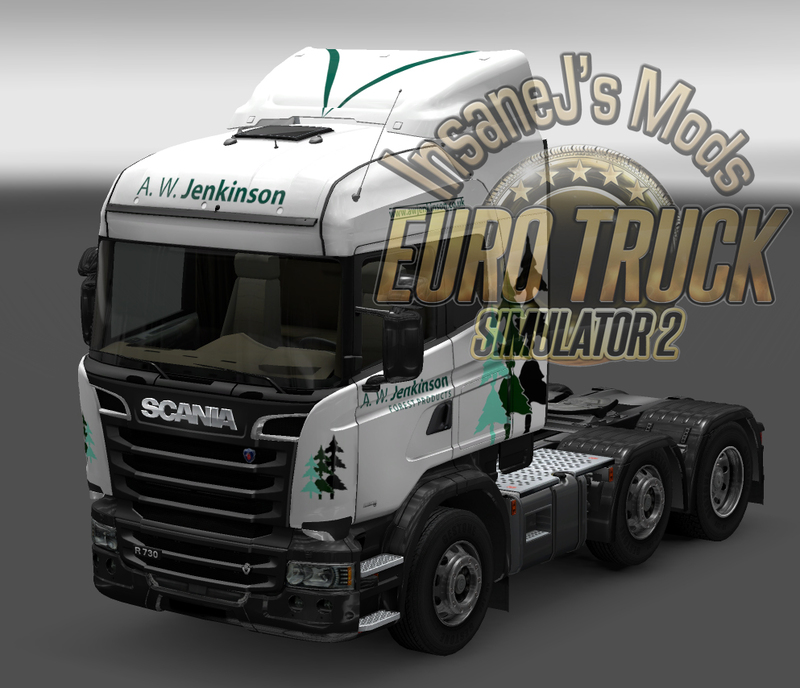 A George Allinson Transport skin for Scania Topline, an SDC trailer skin, and AI combo. The Scania skin has also been updated to work with the Mighty Griffin painted intake. The pack includes a DAF E6 skin, an edited SCS 2 axle trailer, and the AI Ford van. An Anhalt Logistics combo with Scania 2016 skin, three trailer skins and an AI combo. An ARR CRAIB design on the Volvo 2012, standalone trailer and AI combo. A skin for the SDC trailer and including a DAF XF 105/Trailer AI combo. 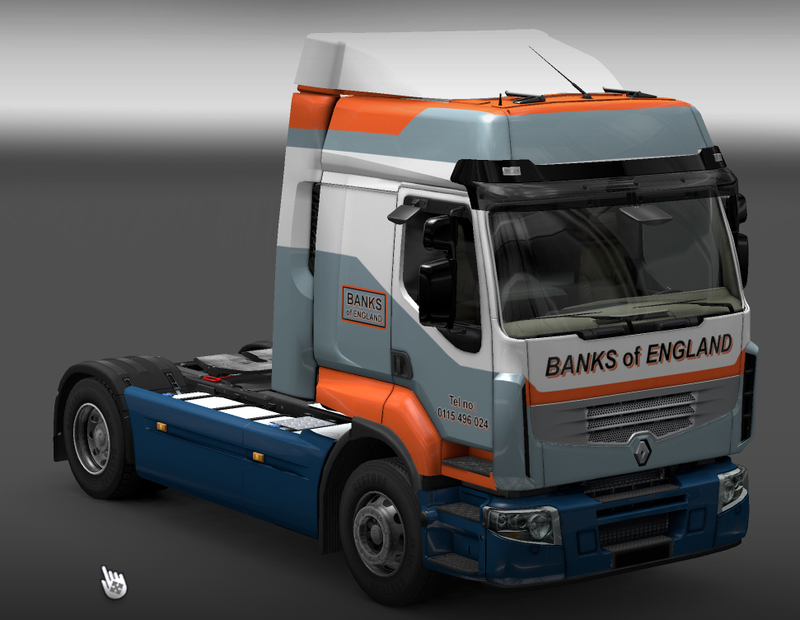 This was originally a custom request for a VTC based on the truck livery from the BBC TV Show. Since the VTC closed long ago I have decided to release it publicly. Credits for the trailer model go to TZ Express. 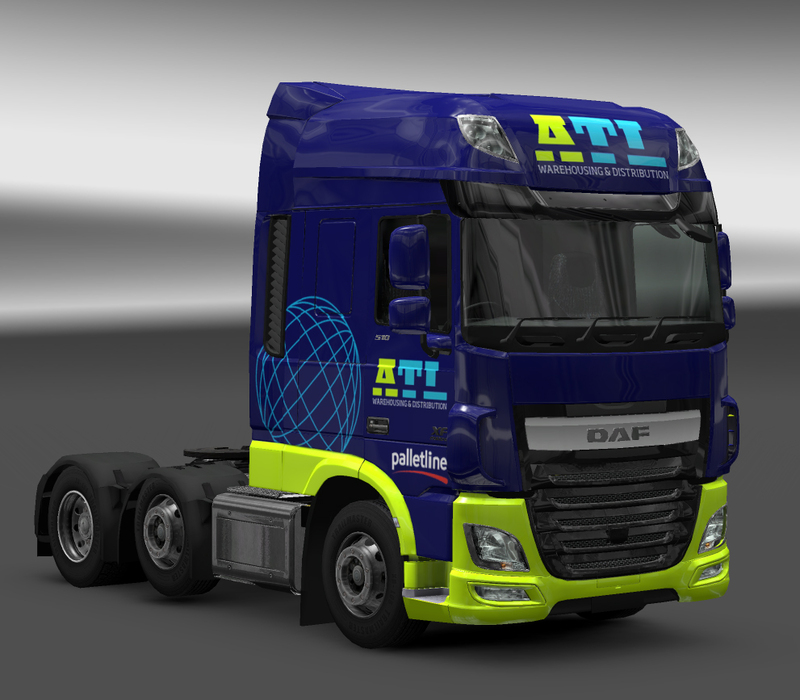 This pack includes a DAF skin, trailer skin, and AI combo. 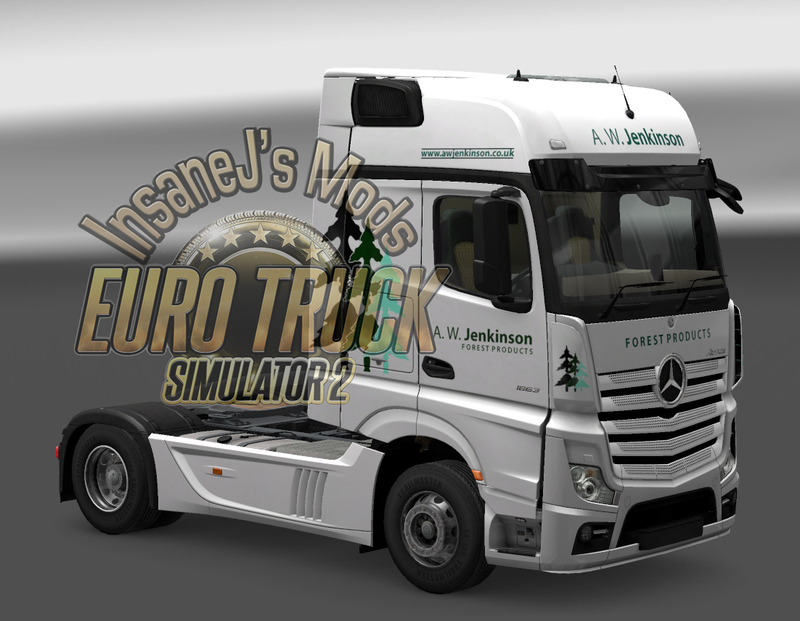 The mod includes a Mercedes (medium size) Actros MP4 skin and a trailer. Also appears in AI traffic. 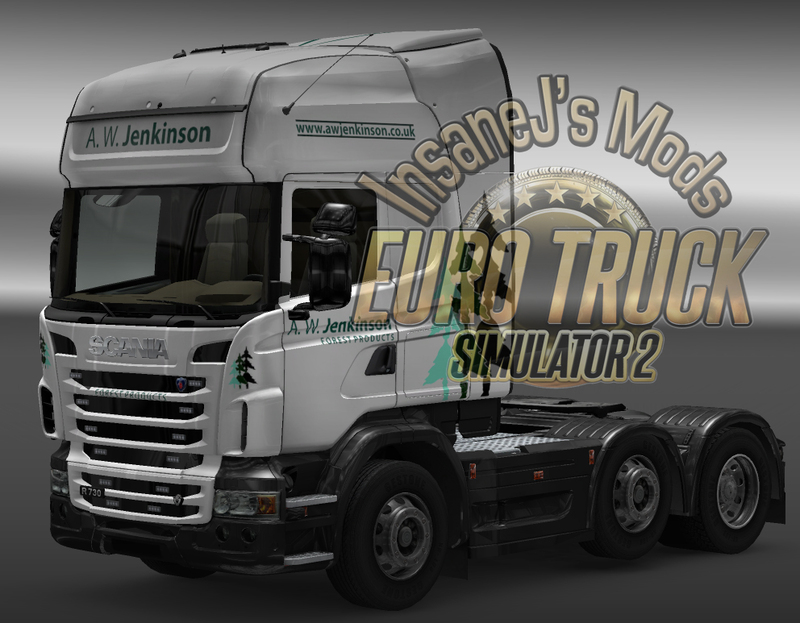 The mod includes an Arjan Eriks skin, a trailer, and AI combo traffic. The mod includes a Scania Highlight (Streamline) skin, trailer and AI combo. A replica of the Green group includes three skins for the Mercedes Actros (MP4), a standalone trailer, and AI traffic. 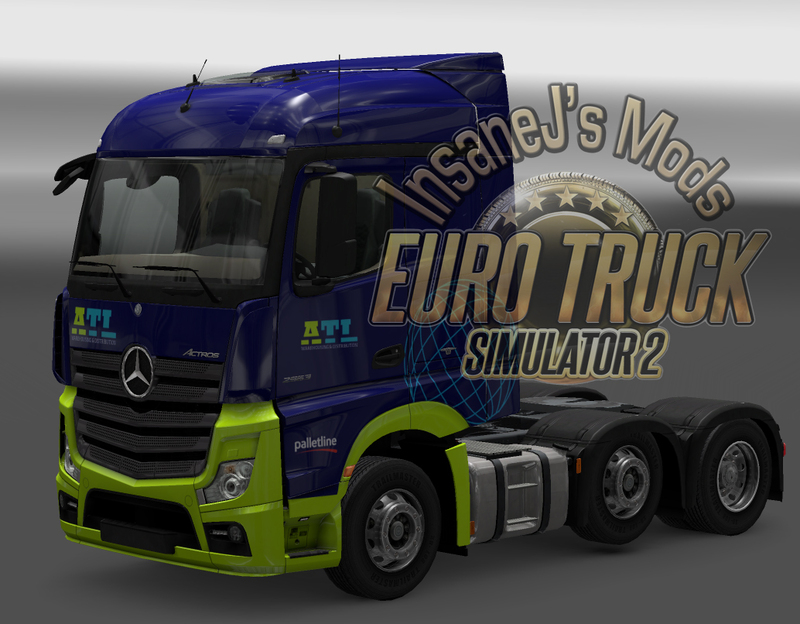 This pack contains a 2 Mercedes skins, a freight market and Owned trailer ( for my Custom Owned Trailer mod) skin and AI combo. This pack contains a DAF XF Skin in the old livery, a DAF XF E6 Skin in the new livery, and trailer skins in both liveries for AI and freight market. This pack contains a DAF XF, Scania R, and Mercedes skin as well as a trailer skin for Freightmarket, Custom Owned Trailer mod, and AI Combo. 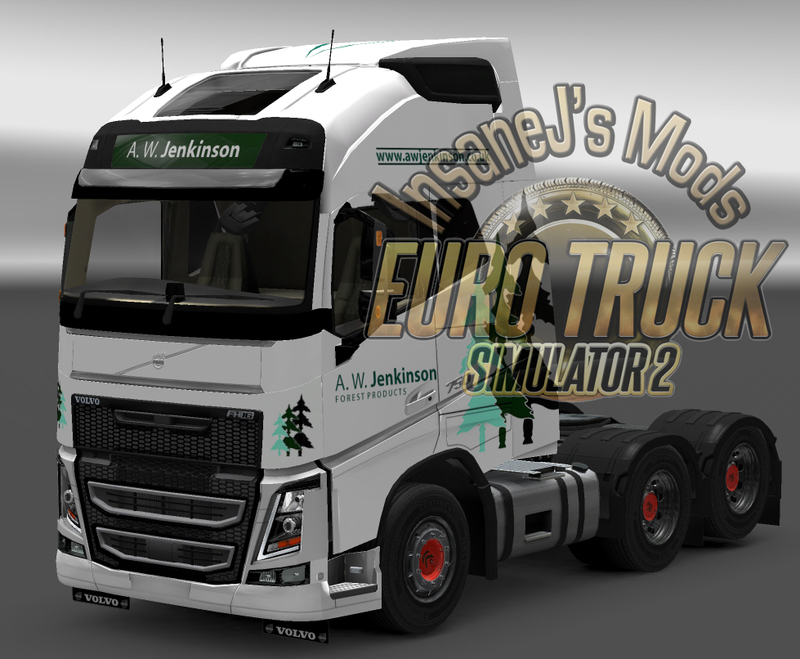 This pack contains four Nestlé trailers, an Actros skin and AI traffic. A Norfolk line combo by request. Includes trailers and DAF and is in AI. Includes a standalone trailer and AI combo. A replica of Verhoek for Mercedes Actros. 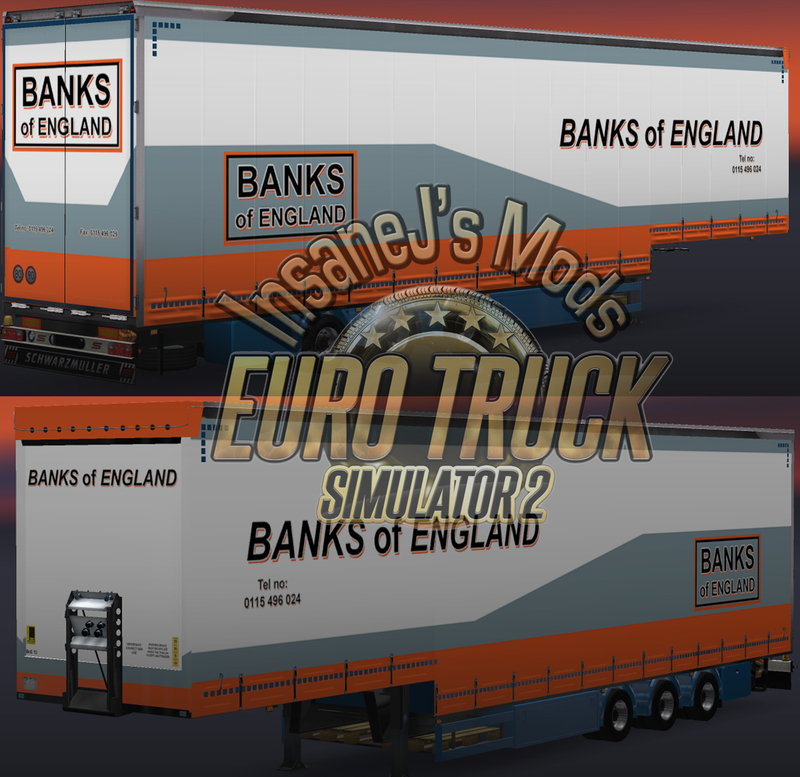 This mod contains 21 standalone trailers based on drinks from Wychwood Brewery. The trailers pull their own custom cargoes, which is also available to SCS trailers. Also included is a Marston’s skin for Renault Premium, Scania R 2016, and AI combo traffic. Please Note: Thanks to scummy pirates ignoring the Creative Commons Attribution-NonCommercial-ShareAlike 4.0 International License all my mods come with, and attempting to make money from my work, this mod will no longer receive public updates via this site. Version 4 (1.32) will be the last version. 2 Skins for both freightmarket and Owned Trailers. Standard Wyvern Cargo and 40yrs Special skin. As of version 4, this mod is Workshop Exclusive. 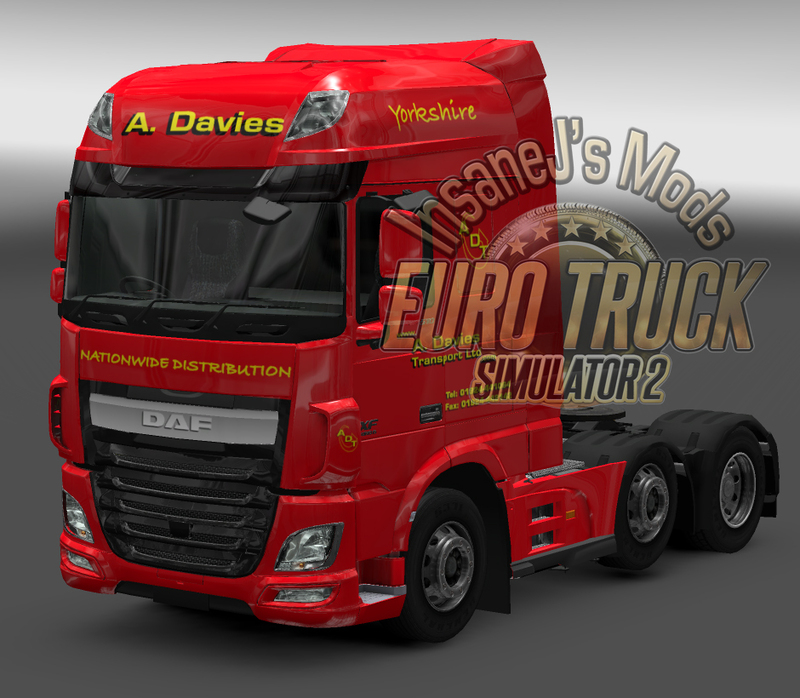 A Yorkshire Tea custom skin for the DAF Euro 6 and 2 two-axle trailers. There are four skin variants for the grill. A Yorkshire Purchasing Organisation skin for MAN TGX and a 2-axle trailer. Where can i find the scania bud for the grampian continental skin ? Hi, amazing work that i have seen on your site. I was wondering if you could possibly make a Tuffenels Daf combo please? images can be found on Google images. Also maybe supermarkets and shops like tesco morrisons aldi and argos? ECT. thanks! Please could to do a M Way & Son combo as I can not find a trailer of Ways anywhere. I will be updating the mod soon to account for the change with Ohaha’s 2009/classic mod. I may consider adding the walking floor trailer as a combo at that time, I make no promises though. Thanks for the reply, I will keep looking to see what you decide. Whatever you do will be great work. Really appreciate these ai combos, keep it up & thanks for sharing! Hi, you’ve already made a McBurneys Company mod and a few McBurney truck skins. Is it possible you could combine the trailer skin in the company mod with a few of the Truck skins to make an ai combo pack? I tried a few times but failed dismally. Could you also make a refrigerated trailer skin as well for the combo pack? Thanks in advance. Fixed sometime ago. Will be included in the next update batch. I really need the files from this mod that I deleted. I don’t keep old versions. Once they’re gone, they’re gone. Although these mods are great. Why do some of the combo mods do not seem to work.I seem to get trailer part of mod but not truck part even they are together in download. The trailers aren’t able to spawn on their own. If you’re seeing a trailer with out a truck then it’s not a combo. If you’re sure it’s supposed to be a combo that you’ll have to tell me at least one of the mods names. hi would’nt know about 1.28 beat as i’ve not installed it yet. Same way you get every mod to work. I love the Allinson combo I’ve had it for years since it was just a skin! I have a request – in fact I beg of you – please update the Allinson truck skin to be compatible with the 8×4 chassis (with toolbox) that comes with the heavy haul DLC. I’m not bothered about whether that company has IRL heavy haulage capability or not (in fact they have 2x heavy haul trucks iirc)…. I could, but then they wouldn’t match the trailer since you can’t have metallic paint on trailers. I have just downloaded Marshalls Combo Mod. Truck skin is ok.
(Sorry for being stupid) How do I get the trailer with the skin please? Update…. I found out in the description about FCP is now Marshall, but when I went go to Site and look for job… None of the skins ( using cog wheel icon ) have the Marshall skin or the trailer with the crane etc. Unless stated on the main blog posts, most mods aren’t updated to 1.32 yet. Re my last comment never mind I found it.